You are worried when your iPhone has a problem and won't turn off properly, or it is frozen and cannot work to power off as usual. That is logical, for most of us, iPhone is a necessity for work and social life. Being to think the worst, possibilities are that you have run out of battery or your iPhone is broken. But fear not, there are 5 ways to help fix the iPhone won't turn off problem. First you need to know the reasons why this issue happens to you. In this way, you can choose the better solution to troubleshoot. 1. A broken screen is preventing the iPhone from responding properly. 2. The "Sleep" button (this is the button on the top or side of your iPhone) is broken, so pressing it does nothing. 3. You are experiencing software problem and that has frozen your iPhone. This is the easiest way to run your phone again. You won't lose any data and your iPhone should go back to normal after doing a hard reset. So, how do you perform a hard reset? Step 1: Press and hold the ‘Sleep/Wake' button and the ‘Home' button in chorus. 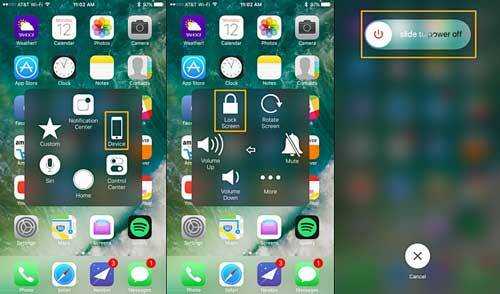 For iPhone 7 series that don't turn off, press and hold volume down & the ‘Sleep/Wake' button. For iPhone 8 series, rapidly press volume up, then do the same for volume down followed by pressing and holding the ‘Side' button (formerly known as ‘Sleep/Wake button). The slider for power off should appear, but you should keep holding the buttons. Step 2: The screen will shut-down and go black. Step 3: Soon, the Apple logo will come on to your screen. When this happens, release the buttons and your iPhone will do a normal restart. Once that is done, your iPhone should be back to normal too. When an iPhone will not turn off, but the touch screen is still responsive, for example, if your ‘Sleep/Wake' button is broken, you can use AssistiveTouch to power off an iPhone. Step 3: Once there, turn the AssistiveTouch on. This shows a new icon on your screen which is the new software-based "Home" button. Step 4: Move the slider and power off iPhone. If the previous two solutions haven't fixed your problem of iPhone cannot turn off, then the iPhone perhaps has a software issue. This can be fixed using iTunes by restoring your iPhone from backup. Step 6. 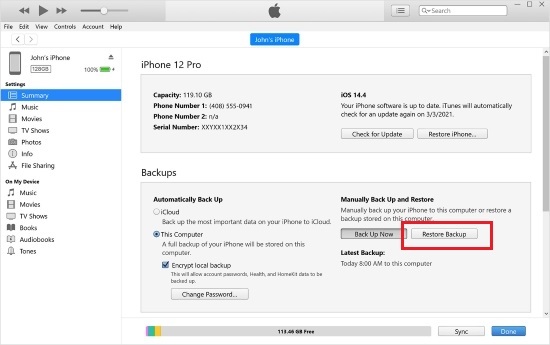 Follow the onscreen steps to select the correct backup and your iPhone should restart as normal. When you are going on the way to repair an iPhone that won't turn off, there is always a slight risk that you lose data. 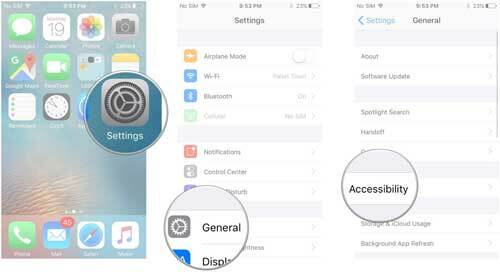 However, if you use Joyoshare UltFix iOS System Recovery you can fix iPhone system without any data loss. Not only can you repair iPhone not turning off, but also you can get out of another 30 iOS problems handily. Best of all, a free option is developed for anyone to quickly enter or exit the Recovery Mode with just one click. This program can even additionally be compatible with iOS 12 and all iOS models without hassle. Step 4. Click on "Repair" button to unzip the firmware and fix iPhone won't turn off issue. If you have tried all of the above and your iPhone cannot work still, it is time to consider taking it to the Apple Store in your town. When you do this, you should always remember to book an appointment in advance and making sure you have a recent backup to not lose your precious photos and other data. This will be the easiest route to finding the problem, as they can run checks and find what the problem with your iPhone really is. There are several reasons why your iPhone won't turn off, and several ways to fixing it. Most are quick and easy to do at home, so you don't have to panic and worry about losing your iPhone. Besides, an iPhone repair software is worth a shot indeed. Nevertheless, if this iPhone turning off issue occurs repeatedly, it is best to take it directly to the Apple Store rather than performing these solutions over and over again. To avoid these problems happening frequently you can take good care of your iPhone, don't drop it or put it in a protective case to reduce the risk of damage. Also, be careful what apps you download and how many, as apps can cause software problems alongside a lack of memory space. You are now prepared to tackle the problem when an iPhone will not turn off without panicking. Simply try these solutions and your iPhone should be back to normal in no time.